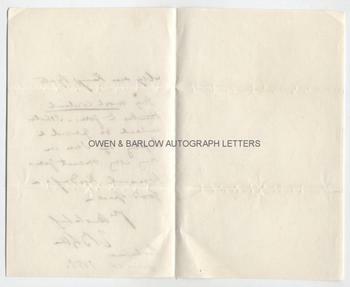 EDWARD BULWER-LYTTON Autograph Letter Signed. 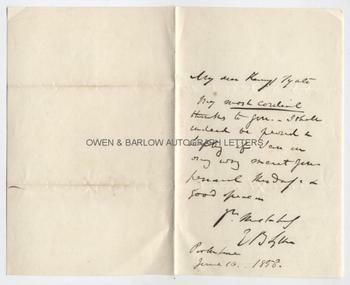 Sir Edward Bulwer-Lytton, 1st Baron Lytton. British (English) novelist, poet and politician. ALS. 1p plus integral blank leaf. Park Lane. June 10th 1858. To Kamyl Tyate. 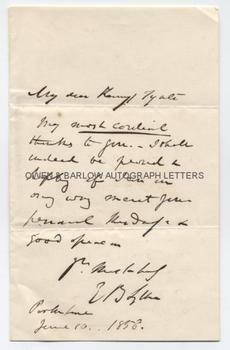 "My most cordial thanks to you. I shall indeed be proud and happy if I can in any way assist your [?] friend [?] Thursday and to good .... [?]." 8vo. Approx 7.25 x 4.5 inches. In fine condition.